The tourist office is closed but the maps of the centre of the town indicate a route to take in twenty bodegas (sherry producers), there are ten on this side of the river we feel this may be sufficient. After the first based in an old sanatorium we are sure, the glasses are about 100ml and generously filled 1euro each. Tony and Tim study the nuances of flavour in the different finos Betsy has a Moscatel and then goes to zumo de naranja. We chicken out after two and go to find something to eat but Chiclana is a small but significant producer of fino and the other classics of the solera method. Before this it was a name on our route. Around on the golf course. 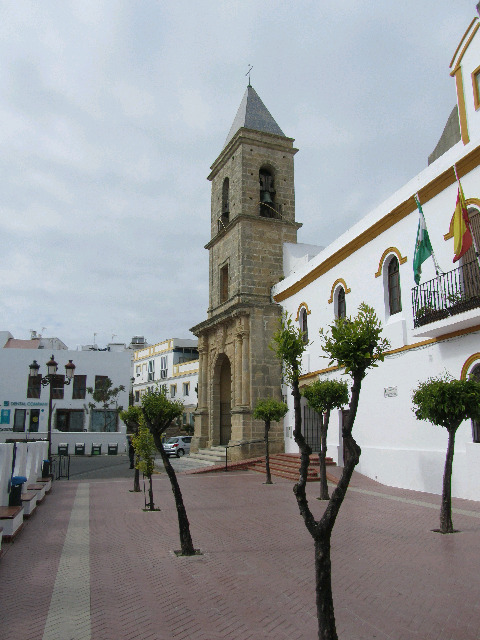 Conil de la Frontera to Chiclana de la Frontera. So what 's about all these Fronteras, there is Jerez as wellas others. These refer to the border between Moorish southern spain centred around Granada and the northern christian kingdoms including Portugal and Castille, the names probably date from the late period (13th C) when Moorish rule was limited to the south east of Iberia, not the earlier time of moorish spain being united as Al Andalus during which even the northern city of Santiago de Compostella was briefly captured. So we set off about 8am in a lovely dawn light with the lighthouse of Trafalgar in the distance behind us along more wooded cliffs with birds and flowers. We pass the port of Conil a couple of miles along in a small inlet and all to soon hit tarmac around La Roche the next 10km are unpleasant as we make our way through holiday home estates (deserted except for CCTV cameras and maintenance men) no bars so no coffee. The holiday home estate merges seamlessly with an area of apartments and golf courses (at least three) through which we trudge on the edge of a fair sized road. We believed that golf courses have 19 holes but these and the sparsely used tennis courts were unable to provide coffee or beer. Eventually we pass though the more normal outskirts of Chiclanas de la Frontera and still spend it seems an age looking for a cafe/bar with a suitable lunch. 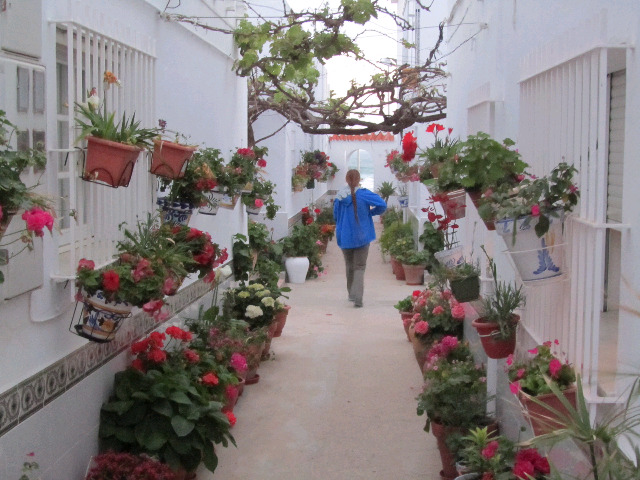 But eventually we eat and find a small room for three in a hostal/pension at 47euros for the three of us. 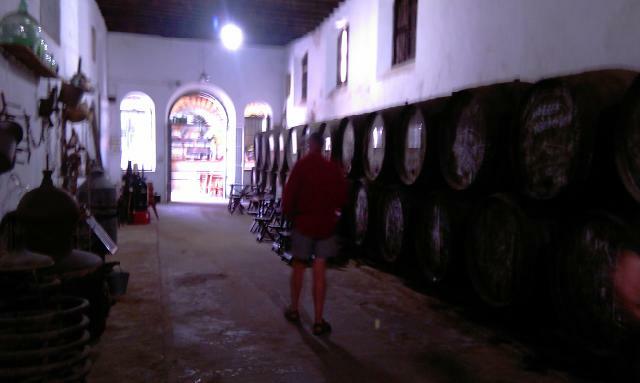 We may try to locate one of the Bodegas (sherry houses) in town once Betsy's recuperative siesta is over. A turn round the tombola. We start out from Barbate at about 8.20 after a coffee in a bar near the port, all these here seem to open around 8am or mostly just after. Out of town past the deserted nightclub (sensibly placed a few hundred metres from nearest dwelling and on to the beach for a short hop. Very soon we climb the cliffs we mistook for Cape Trafalgar yesterday and wander through pine wood full of green and goldfinches. The pines were planted late 18th and early 19th century to stabilise the dunes along the length of these small cliffs. As before flowers including orchids are numerous, rain threatens but never really happens to us though patches of sand appear to have recently received it. We descend from the clifftop forest to Los Ganos de Meca and find another cafe just opening, the couple running it walked to Santiago two years ago and spot the badge on Tony's rucksac, we get cake as well as coffee! 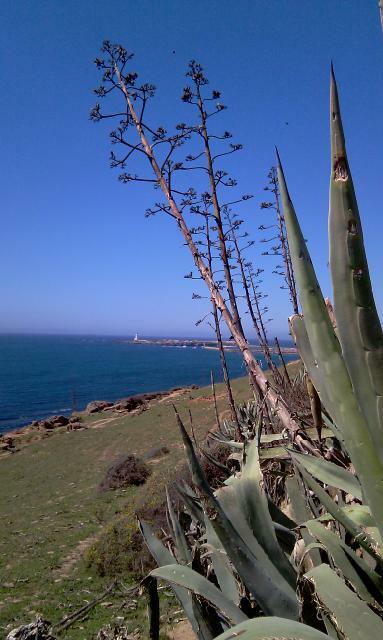 We now approach the Faro (lighthouse) at Trafalgar, although a headland, Cape Trafalgar is only about 15m above sealevel and is reached by a spit of mixed rock and sand. This is the tombolo, an isthmus thrown up by the action of two opposing sea currents on a promontory similar in the UK to Chesil Beach and Poftland Bill, although here the mix of sediment from the sea's action is sand and large flatish rocks instead of the regular large pepples we remember from crossing the channel from Weymouth on our first Camino. Some have been piled into cairns across the route. quite extensive and we go for three tapas, pollo (chicken), carne (meat), both which come with a few fritas however Tim opts for the unknown Ajielas de Huevos, (when it arrives we are no wiser). Tony translates from the internet ajielas as dressing but Betsy swears huevos is eggs and it looks and tastes nothing like egg. Eventually we realise from the faint fishy taste and gritty texture we are eating roe and Betsy's hard work with the Spanish cds and books is vindicated. We are now only about 4-5km from Conil our destination but along the beach (the direct route) lies a significant river, the Rio Salado. 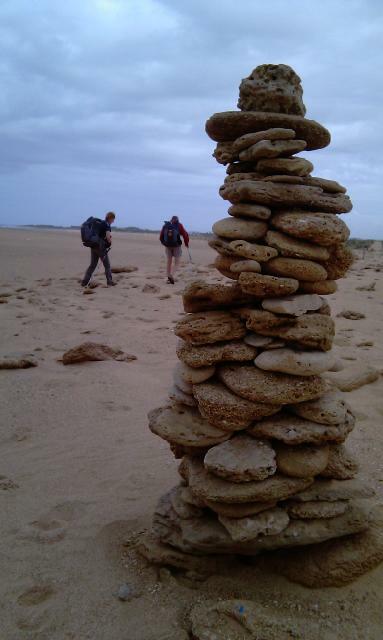 Google maps suggest this is crossable at low tide on the beach but we have doubts, happily the locals have built a footbridge and we enter Conil de la Frontera in fine style direct from the beach and find lodgings eazily along the front. Another day at the seaside with a mixture of roads, tracks through dunes and a long stretch just above the water line as we approached Conil. Early in the day we passed a museum of jam - could we have resisted it if it had been open? A ruined house with a view provided shelter from the wind for a few minutes for a rest and a snack. A week since we arrived in Andalusia and Jane has now departed for home, Maurice (the cat), her Brownies and the Ramblers, most (though not all) are not doing as many miles per day as we. 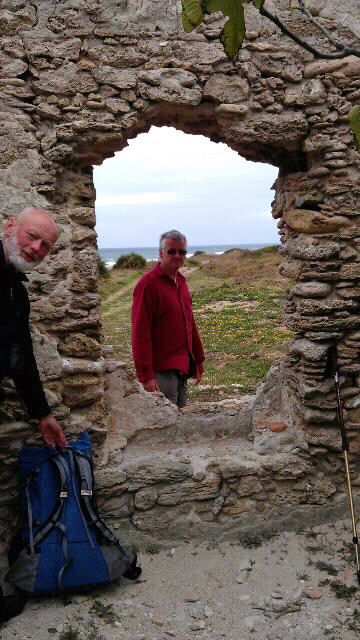 Before setting off for Malaga Airport she dropped us off at the Roman ruins we visited in Bolonia and where our Camino truly begins. Our route first takes us up over the sand dune at the west end of the beach (claimed to be one of the biggest in europe) just as dawn is breaking, and then down to a nearly 15km stretch of beach. We toil along the sand, in bare feet, boots or sandals according to taste and after a few hundred metres it firms up to a good piste and we scoot along chasing three long legged birds (? Blackwinged Stilts) until we reach Zahara and a mid morning coffee. Other birds of note spotted during the morning include 2 ostriches (yes, we thought we might be hallucinating too!) and an owl. Most likely a little owl as they are known to be partially diurnal, just out of Zahara after the bridge over the great green greasy Rio Cachon. 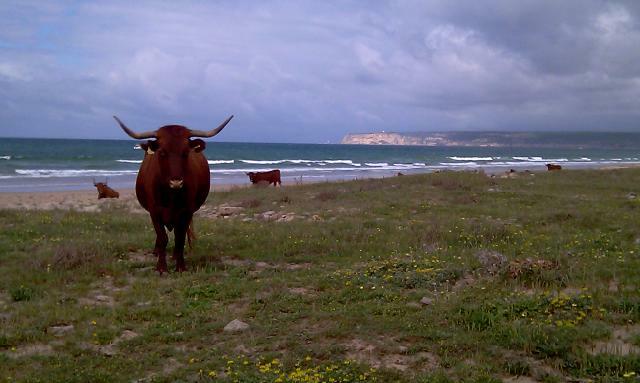 The next two hours are a great wander along a track through the littoral area just back from the beach past many wild flowers in bloom and a herd of Andalusian cattle just sitting or standing around on the beach. 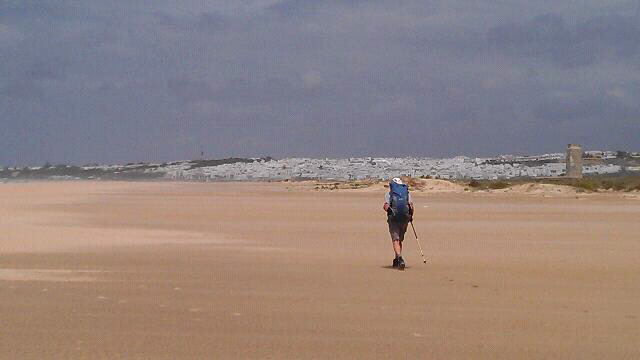 Cape Trafalgar in the distance gets gradually larger but never arrives. 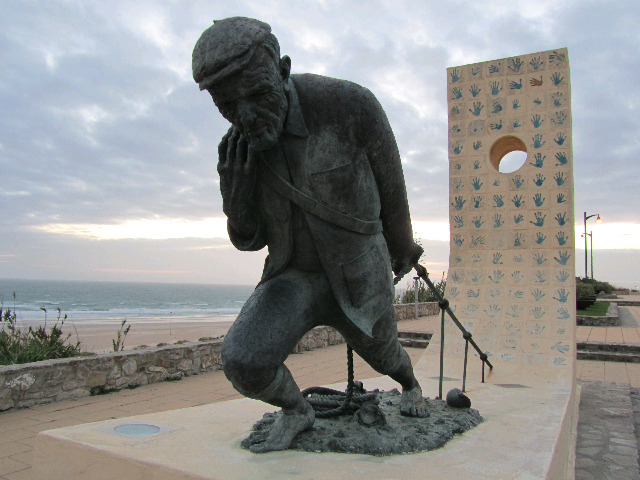 We reach Barbate just after the cold front forecast for midday arrives on schedule and are seen in a variety of one legged poses donning waterproofs at the side of the causeway into town across La Brena and the Marismas de Barbate (wonderful spanish word not really needing translation). The town in mid April is largely shut and we think that there would be more (possibly cheaper) accomodation available a little later in the year. Total distance 22km in five and a half hours. Well another day of relative idleness! 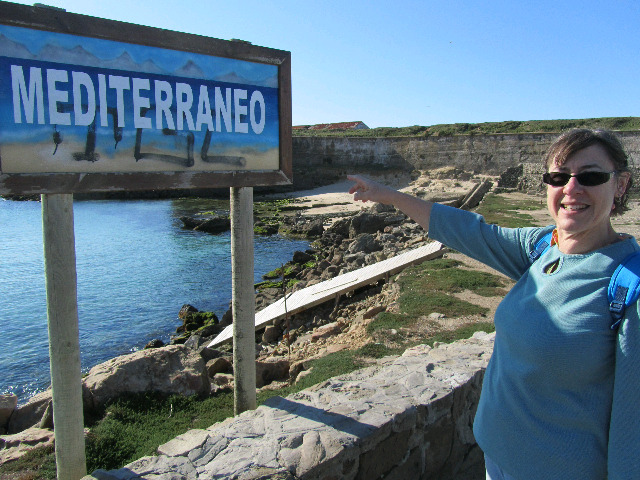 We walk back up the coast path a mile or two toward Algeciras and have lunch in a little cove. 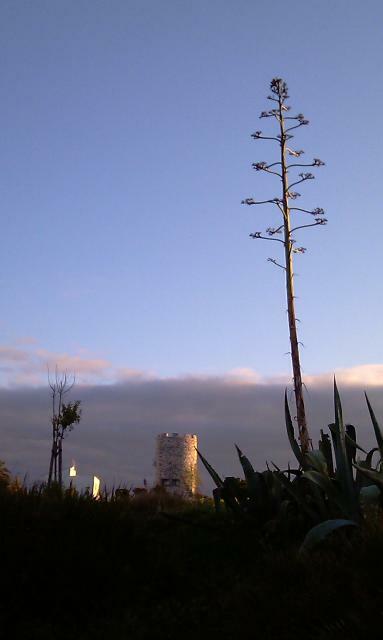 Tha coast path is flanked by recently flowered agaves with their enormous, but now dead flower spikes. 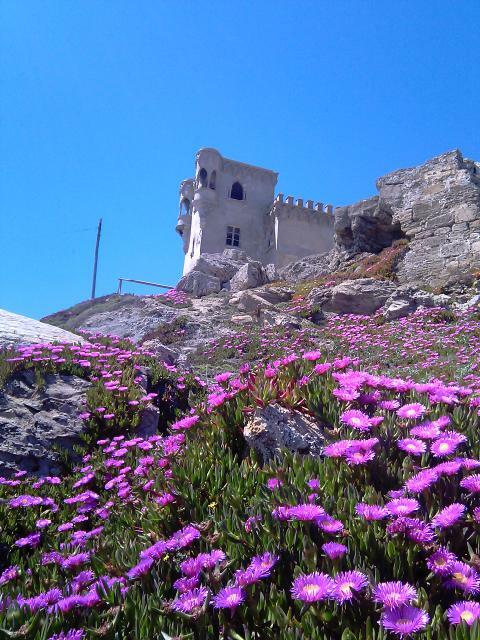 The lighthouse on Isla de la Palomas at Tarifa and the mountains of Morroccp provide a background of white and blue. As well as the usual kestrels we see a flying stork, several warblers probably Sardinian, and Stone and Whin chats. A pleasant day the walking stats in earnest tomorrow about 8am at Baedio Claudia, the forecast? May be a little damp. The last GR10 trip took 13 years to get from the Atlantic to the Mediterranean , today's only took a few seconds. A day of rest during which we walk from Atlantic to Mediterranean, not as in years past by the GR10 but across the causeway to the Isla de las Palomas to actual southerly point at the side of the new ferry terminal. There is, all arround in this town evidence of past strife. The castle of Guzman the Good (not as might be supposed the collegue of Gandalf the Grey) but the first Duke of Medina Sidonia. Those up to speed with their history might recall his descendant (the 7th duke) who headed up the Armada. The gun emplacements built by the British to defend the Isla during the Napoleonic occupation of Iberia. And the Second WW pill boxes next door to the other moorish looking castle of indeterminate age. Much of the rest of the day we lazed on the roof of the little appartment in the sun and such lack of wind that Tarifa seems to experience. The roofs around the appartment (see Betsy's pic) give a Peakeish air of Gormengast to the town and it seems much of life on the summer is spent on the cooler roof tops. 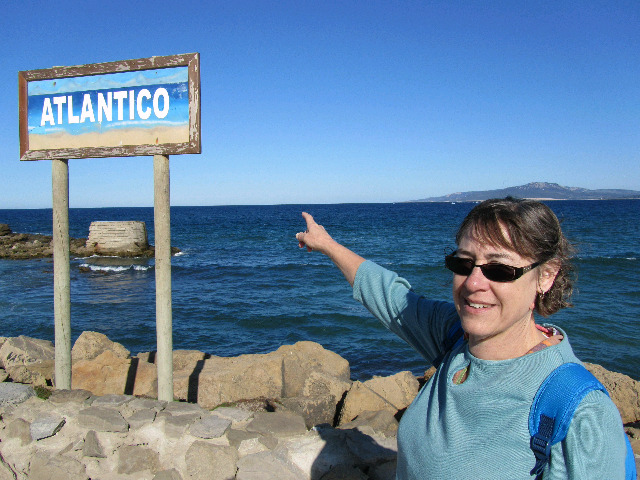 Jane will be back off to the UK on Wednesday and the walk will start in earnest, meanwhile we enjoy the sun and rest.